Am sure you have come across Twitter at some point of time in your online experience. Don’t bluff and say that you have never heard of it. I think it is an outright understatement to say that Twitter is going to change the world. It already is. Existing power users of Twitter will agree with me and I would love it if they could add on to what I am going to say here. Before I elaborate on how Twitter is changing the world and what it actually is all about, it is important to put a few things in perspective, namely the evolution process of human communication. This will enable us to understand the significance of Twitter in today’s times. Of all the wonderful creations of god, man is the only one with the most sophisticated communication network. He is blessed with that unique piece of software and hardware called the Human Brain. There was no language when he started out. He began with scribbles and carvings on walls as pictures and sculptures, then went on to invent the spoken and written language, invented paper and wrote books. Then came the printing press, which in retrospect probably was the single most important invention of humankind along with the wheel. Large-scale reproduction of books and the advent of newspapers changed human history forever. Leading to awareness and education among people, thereby setting the path for the industrial revolution. Great scientific discoveries were made based on this, leading to many more future inventions. Telegraph, telephone, radio and then television and much later - more closer to our times, the invention of the computer, internet and the mobile phone, all fulfilling only one need: the need to communicate and to communicate better and faster. Whew! We have come a long way since those prehistoric days. But wait, there is more that has happened during this time. Another interesting thing started happening at the same time. That is the concept of minimalism or miniaturization. Small and fast being the buzzwords of invention when it comes to communication. We have smaller and faster gadgets that fit into our pockets today replacing yesterday’s machines that occupied entire rooms. Interestingly, this not just meant changes to hardware and technology but also to the human mind. Now it desired information to be concise. Why read an entire book to understand any concept when you could just Google it up to see what it means? Instant gratification being the current mantra. Here comes Twitter, the weapon of choice to tackle the most important question: faster, shorter and reliable information or news to cater to our shrinking attention spans. So what is Twitter after all? The first time I logged into Twitter I wondered what all the fuss was about. It had nothing in it. Nothing at all. But today it is more important to me than my daily newspaper. To put it simply Twitter is nothing but a means to write a short message with a maximum of 140 characters, that’s all! These messages are called Tweets. One can write about anything in those Tweets. Once you log into Twitter, you can choose to follow whoever you want to - to see what they are tweeting. And anyone can choose to follow you – to see what you are writing. It’s a simple network. You follow people and people follow you. The person you want to follow need not be your friend unlike other social networking sites like Facebook and Orkut. Twitter is a free world and all you have are those 140 characters to express yourself. Sounds simple, yes, the most powerful and useful things in this world are the simplest. The wheel for instance, a simple circular object, no complex shape to it, but the world is unimaginable without it. Twitter is the same! It is easy to use and has the ability to spread any message in real time anywhere in this world. In those Tweets, apart from your thoughts you could share links to articles, photographs, polls, etc. Twitter provides a peep into your mind and in the bigger context opens a window to see what the world is sharing and talking about. I am tempted to get into the detailed technical aspects of Twitter but I will leave that exercise to you. You can Google it up to see how you can have # and @ symbols before words to make them readable and reachable to anyone searching those specific words. There are tons of articles on Twitter. As a trial, to see the power of Twitter first hand, just type any popular term in the Twitter search window and you will see a stream of real-time messages from the collective humanity. It is a magical thing to see for yourself. Now let us get back to the original purpose of this post. How to beat Superman? We have already been doing that and getting better at it. If Superman can hear every conversation in this world and act in time, so can we, thanks to Twitter. It is only a matter of time before anyone and everyone with a few fingers and half a brain would be on Twitter. It is inevitable. Already most people like me don’t wait for critics, experts or journalists to hear feedback on any movie or product or event. We just go and see what the world is talking about on Twitter. This gives the best feedback, it’s a democracy and the news is real-time as it happens. I doubt if even Superman could imagine this happening. There are plenty more things I can talk about the power of Twitter but I would rather let you also explore and talk about it. Now, the only thing left for us is to figure out how to fly like Superman. 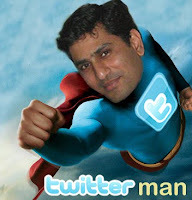 I have a terrific post coming up on the flying man. So stay tuned for future updates on my blog. I will leave you for now with one of the most useful and fun applications built around Twitter: http://trendsmap.com/ Shows what the world is talking about right now. Also just type in any current popular term (eg: Avatar, Tiger Woods) and see who is talking about it right now. I guess this is what Superman must be seeing daily. PS. Also, after reading all this, do not forget to click on the little bird to your left that says follow me. Or the following link http://twitter.com/kartikdayanand. Do I need to explain why?